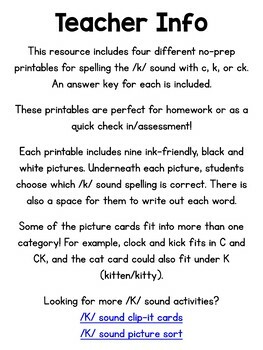 This resource is available at a discount in my /K/ Sound Spelling Bundle, along with word work clip-it cards and a picture sort. 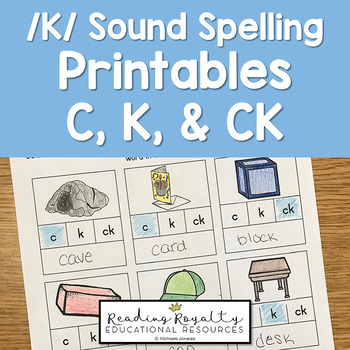 This $1 deal includes four different no-prep printables for spelling the /k/ sound with c, k, or ck. An answer key for each is included. 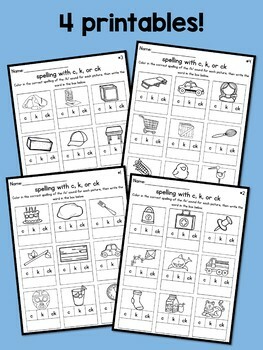 These printables are perfect for homework or as a quick check in/assessment! Each printable includes nine ink-friendly, black and white pictures. Underneath each picture, students choose which /k/ sound spelling is correct. There is also a space for them to write out each word. Some of the picture cards fit into more than one category! For example, clock and kick fits in C and CK, and the cat card could also fit under K (kitten/kitty). Looking for more /K/ sound activities? C, K, CK Printables by Michaela Almeida is licensed under a Creative Commons Attribution-NonCommercial-NoDerivatives 4.0 International License.